We’ve all heard and read the theories about Artificial Intelligence coming after jobs and wiping out industries. While some are hopeful of this new breed of technological advancement that relies on machines doing our jobs better than us, there are others who fear that risks outweigh the benefits. 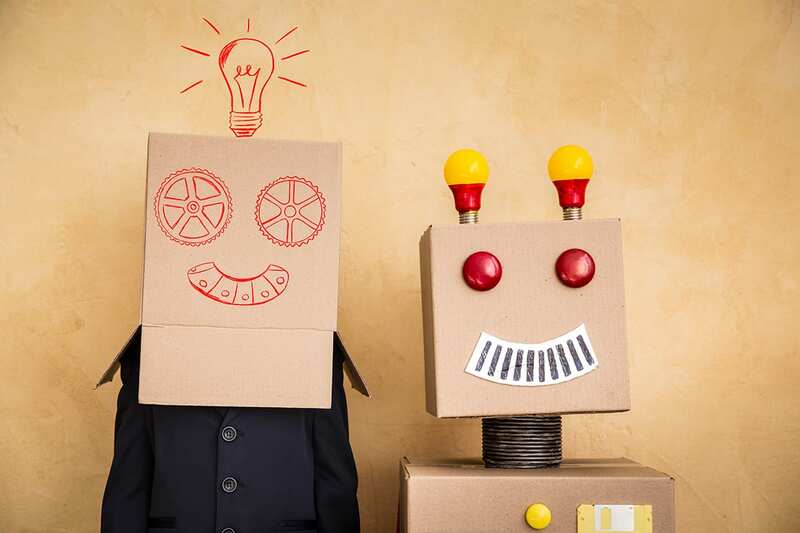 Whichever side you lean, there’s one thing everyone seems to agree on — the inevitability of AI. Believing and implementing this technological advancement is inFeedo, a Gurgaon, Haryana based startup, founded in 2013 that has been using AI in HR to solve the various problems. The technology by this startup is helping CHROs of companies like Airtel, MakeMyTrip, Dominos etc. predict attrition and measure the culture of their organisation in real-time. The classic HR challenges of retaining top talent and measuring the culture of an organisation have all been abstract and highly subjective so far. Working closely with the HR industry for over three years, the startup has learnt that people in a company are statistically more likely to leave at certain milestones in their lifecycle. The timing of interactions at these milestones could prevent these employees from leaving the company. Based on this and much more learnings & experiences that the startup has come across, they have been constantly innovating in terms of their products and offerings. 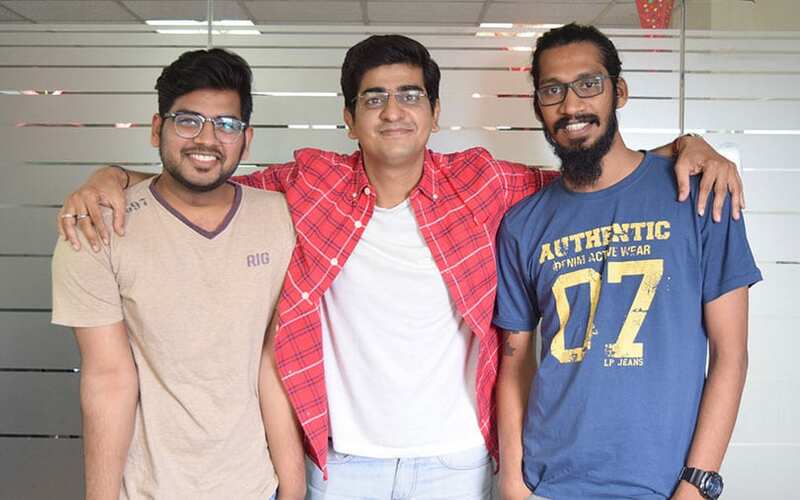 inFeedo, which was co-founded by Tanmaya Jain and his college roommate Varun Puri, when they were 18, came up with a chatbot “Amber” to have a personalised touch point with the employees of a company. The chatbot can interact with these employees at certain milestones in their life cycle at the company. Covering the candidate’s work experience all the way from candidate’s first day, first month, six months, a year and exit, Amber asks the employees certain questions. These questions could be about onboarding, interaction with reporting managers, work culture and other elements impacting an employee’s workplace experience. While Tanmaya’s focus is primarily on spreading Amber across companies, Varun majorly works on using AI to build the product that their clients have grown to love. It is interesting to note that the founders got the idea of founding inFeedo after noticing the plight of their friends working in huge organisations, where it is hard for employees to have their concerns heard and for the upper management to listen to each and every employee and make their voices felt heard. 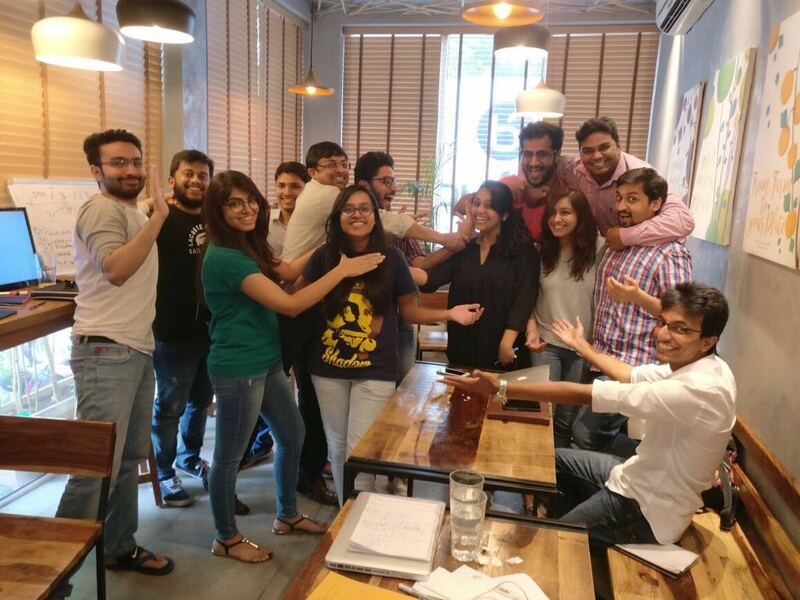 After having spoken to 100+ CHROs across India to understand the problems they face on a daily basis, inFeedo team ran a Google Design Sprint, the result of which was the AI-enabled chatbot Amber which was born in August 2016. 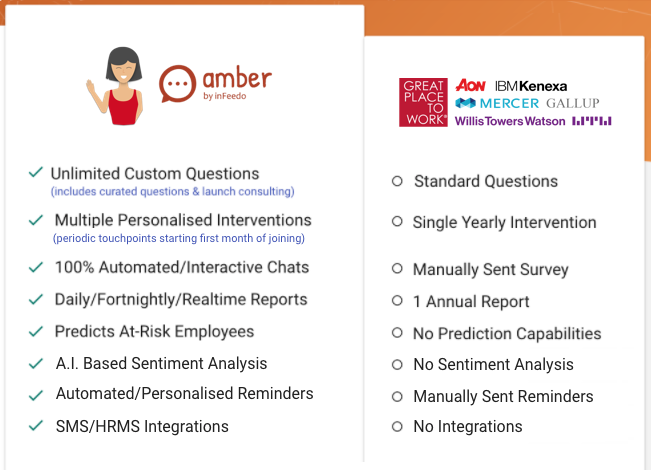 To make sense of all the conversations that Amber has with the employees, the responses are passed through a set of Sentiment Analysis algorithms which assigns an overall polarity to each conversation. The next step after this is using Machine Learning algorithms to segregate the employees into different risk zones on the basis of several factors which include the sentiment of their interactions with Amber. Further analysis can be done on different themes like Onboarding, Training etc. Being in the AI space, the major challenge that the startup faces is educating the client base about AI. The inevitability and speed of AI can really transform the way HRs function. The startup believes that “What bicycles are to legs, the computer is to the brain, is what AI can be to HR”. Amber has proven its mettle in measuring an organisation’s culture in the real-time. Since it’s talking to several employees in an organisation on any day, it can accurately highlight the trends and warning signs on a macro level. This allows CEOs and company heads to do a continuous culture evaluation of their organisation. The startup claims that before Amber came into existence, several of inFeedo’s clients used the services of companies like GPTW, Willis Towers Watson, AON Hewitt etc. to assess their culture. These culture audit firms did an annual survey to analyse the shortcomings of an organization’s culture. “However, the results of these annual surveys failed because of several cognitive biases and fallacies arising out of these surveys being a one-off thing. Most of the time, the findings of these surveys are not implemented and the status quo remains unchanged till the next annual survey”, the company noted. This is where the AI in HR assists CHROs with continuous culture evaluation and implement change one step at a time. As Amber grows across several industries, it aims to start offering real-time culture benchmarks to its clients. inFeedo believes that this will help organisations move from annual culture audits to real-time culture audits helping them make small course corrections resulting in bigger changes. inFeedo has been a profitable bootstrapped startup, with initial funding being secured by ex-Head of Google India Operations, Palash Jain (who is also Tanmaya Jain’s father). The co-founders also found success at the nationally televised Vault Show where investors were seen fighting amongst themselves over funding inFeedo’s vision. “It’s time companies build Great cultures to work in than merely Great places to work for”, the startup said in the concluding remark.